It is important to note that domain name registration does not require that webhosting be purchased with it, just as webhosting does not require domain name registration through HostGator's registrar LaunchPad. You can choose to sign up for either one separately. Does HostGator Protect Me from Domain Name Sniping? If you are ordering a new web hosting package with HostGator, it is best that you register your domain at the same time you purchase your web hosting. On the web hosting order form, there is a section where you can register your domain. Simply specify the domain you want to register on the order form, and we will include it in your order. If the domain is not available, you may either search for a different domain, or add a recommended alternative domain to your cart with the Add To Cart button. Privacy protection may be added or removed from your domain by clicking the x or + next to Privacy Protection in your cart. You may search for additional domains you wish to purchase, or click the Add To Cart button next to any domain recommendations you'd like to add. Once your selection is complete, click the Continue To Checkout button. If you do not have an account, you will be prompted to create one, or you may use your existing billing account credentials to login. You may review your cart again, and have the opportunity to change your registration term, remove extra domains, or domain privacy. Click Continue to Checkout to proceed. Select your preferred payment method, enter your details, and click Place Your Order to complete your purchase. To register domains not supported by the online portal, or to pay with another method, please contact our Billing department via phone or Live Chat, and we will assist you in registering your domain. Note: Any domain that requires Live Support to register can only be registered by a customer who already has a HostGator billing account. A HostGator billing account may only be acquired by purchasing hosting from hostgator.com or an eligible domain from register.hostgator.com. HostGator's domain management system allows customers with Hatchling, Baby, or Business plans to register new domains and manage existing domains within cPanel. Just look for the Domain Management icon under the HostGator Links section of your cPanel. This system is linked to the customer's billing account and can be used to register new domains as long as there is an existing credit card on file on the user's hosting account, and knows the billing username and password. HostGator cannot guarantee protection from domain name sniping; no one can. To protect your investment, domain registration should be paid for at the time the domain is ordered, and the payment must have time to process. It might be a good strategy to buy a desired domain name before purchasing hosting for that domain. How Can My Domain Name Get Sniped? There are plenty of ways that a domain can be obtained through sniping. Some of the most common methods are listed below. It is possible someone else registered the domain name before you did, and the domain still showed as available when checking the availability. It happens often that someone orders a domain registration but does not render payment immediately. In that case, anyone else can register the domain name and get it before you do. It is also possible after searching for available domain names at another website that registers domains. Some of these registrars are not ethical and have been known to steal domain ideas and then auction the domain back for a much more expensive price. Remember: You can trust HostGator to never snipe any domains queried. We are a reputable registrar, and we will stay that way. Feel free to use our tools and services to search for your potential domain names. Fortunately, ICANN does attempt to discourage this practice by limiting the number of domain name refunds that are allowed by a registrar. If the domain cannot be refunded, then the corrupt registrar is less likely to risk their money. We strongly recommend using hostgator.com/domains to search for available domain names to avoid domain sniping. LaunchPad is HostGator's own domain registrar. Any domains registered during the initial account set up of Shared and Reseller plans will be part of this system. 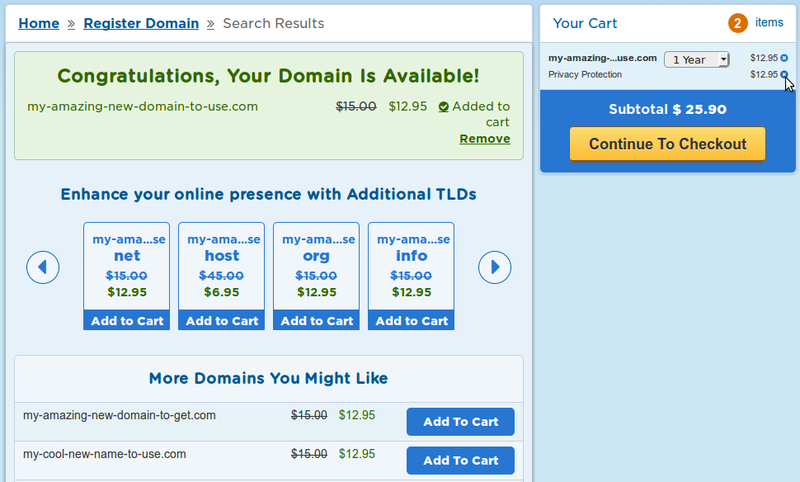 LaunchPad also allows you to purchase domain names directly at hostgator.com/domains.